​The Saharawis are a former nomadic and tribal people sharing cultural traits with Mauritania shaped from Berber, African, Arab and Muslim roots. They were called Sons of the Clouds by their Spanish colonisers, due to their constant search for rain and green pastures to feed their animal herds. They are people who knew no strict boundaries and loved their freedom, but who nevertheless roamed within the area known as Trab el-Bidhan. This region extended from Wad Noun in southern Morocco down to the Senegal river in the south, encompassing Western Sahara and Mauritania, and from the east of the Hamada in Algeria and Mali to the Atlantic coast in the west. 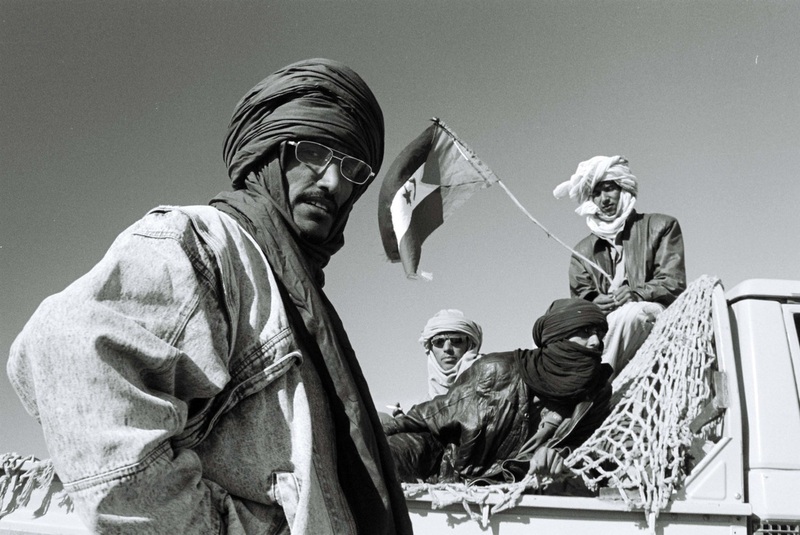 They had a strong sense of belonging and connection to the landscape of Western Sahara. This is reflected in their rich oral traditions, which were passed on from generation to generation in their spoken language, Hassaniya. Nowadays, Saharawi culture and society must be considered from two different perspectives. Under Moroccan occupation, Saharawi culture has been highly affected by the imposition of Moroccan traditions and values; while in SW Algeria, the Saharawi refugees have attempted to keep alive a distinct Saharawi society and cultural identity under extremely hard conditions. The influence of diverse cultures, especially Spanish, Cuban and Algerian, has been particularly significant as many Saharawi children and youth have had to spend long periods of time studying abroad. Saharawi women have always enjoyed freedom and respect. In their previous nomadic way of life, they performed important social roles, such as family educators and managers of their encampments. They were able to re-marry without stigma, and were integral to cultural and spiritual transmission. Because men were often away with their animal herds, women were also in charge of hospitality towards guests, one of the most important traits of Bidhan culture. Although their autonomy was threatened during the Spanish colonial rule, it was regained during the Saharawi revolution. During the first years of exile and war, women were the pillars for the building of the Saharawi refugee camps in SW Algeria, supervising the national administration, education and health systems while the men were at the front. Today, women have important roles at political, social and family levels. Currently, there are three female ministers in the Saharawi government, and the vice-president of the African Union is a Saharawi woman. Under Moroccan occupation, Saharawi women have consistently supported the Saharawi right to self-determination through peaceful activism. One of the best examples is Aminetu Haydar, who led the 2005 Saharawi intifada, and has been imprisoned and tortured in several Moroccan jails. The Saharawis speak Hassaniya, a unique blend of Arabic, Berber and Spanish that has become an important means of expressing Saharawi identity. As a traditionally oral culture, sharing stories, fables, poems and songs in Hassaniya has been part of Saharawi society for centuries, often around the tea ceremony. Through these oral accounts, the Saharawis have documented aspects of their daily life and their nomadic travels, as well as preserved their collective historical memories. 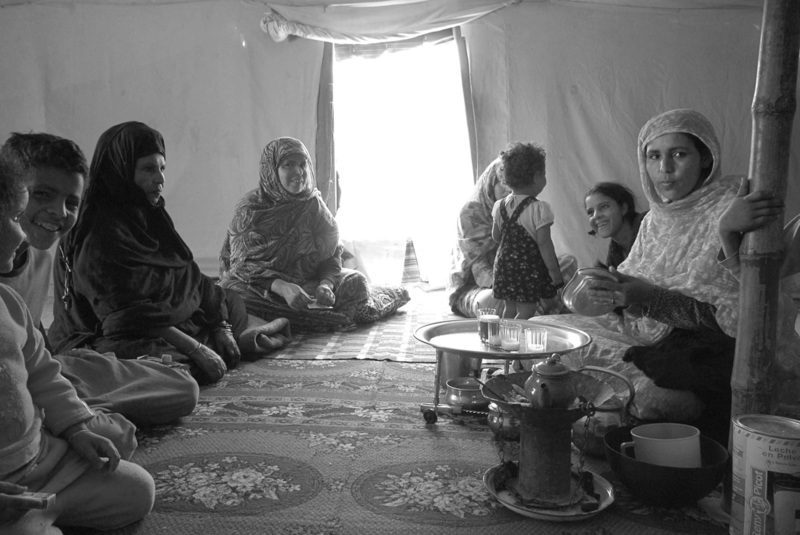 In the refugee camps, the Saharawis speak Hassaniya on a daily basis, but Arabic and Spanish are the official languages. Spanish is also widely spoken due to the large number of Saharawis who have studied in Cuba. In recent years, more and more Saharawis are learning and using English. However, in the parts of Western Sahara occupied by Morocco, a former French protectorate, the Saharawis are taught French and Arabic at school. The Moroccan dialect of Arabic, the Darija, is dominant in most public places and the new generations of Saharawis are gradually loosing their knowledge of Hassaniya. The Saharawi tea ceremony is one of the most important rituals of Saharawi culture, their hospitality and spirituality. The tea brewing is a central activity in gatherings. Saharawis usually drink three little cups of strong and very sweet peppermint tea at every one ceremony. 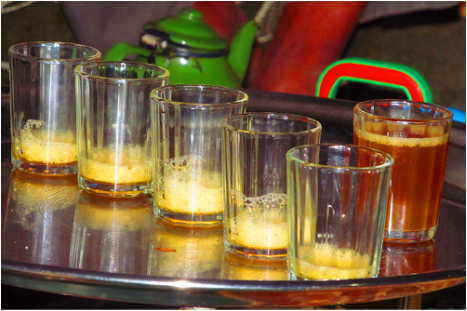 Saharawi saying describes the tea as an expression of their spirituality: the first cup tastes as bitter as life, the second as sweet as love and the third as soft as death. In the 18th century, Western Sahara was understood as a haven for trade, as a gateway to the Great Sahara and North Africa. It is through trades with the British, that tea was introduced to the Saharawis. 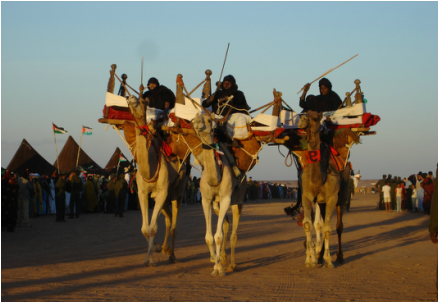 The beverage soon became popular among the indigenous people of Western Sahara and the ceremony itself was adapted to the long journeys through the desert on camel backs. As tea or sugar cannot grow in the region and the Saharawis needed to trade for these luxuries. It is said, that tea was so precious that the Saharawis were reluctant to offer their guests tea. However, reminded of their infamous generosity, the Saharawi tea ceremony soon became obligatory and a central aspect of their hospitality. A tea ceremony requires a teapot made of tasmint (type of metal), called abarad or abrig; a tray, tabla, made of red or yellow bronze; bowls for sugar and tea, named kuntya and a’msar; and a pump, rabuz, to keep the fire alive.